It’s been a while since I’ve checked out Many Eyes, but this one below has been on my list to review for a while now. Click around to get a flavor for their presentation. The mouse-over feature is smooth and quick. I like the format of the text and how the state becomes outlined. You can easily switch between metrics with the drop-down box. You can show one, two or all maps at the same time to make comparisons more easily. Initially, when you show more than one map, the color scales are unique to each map, but there is a simple checkbox that aligns the scales. The brushing/highlighting feature works well when you show more than one map, which makes comparisons between individual states even easier to make. I like the choropleth maps, a feature we’re all still waiting for in Tableau. 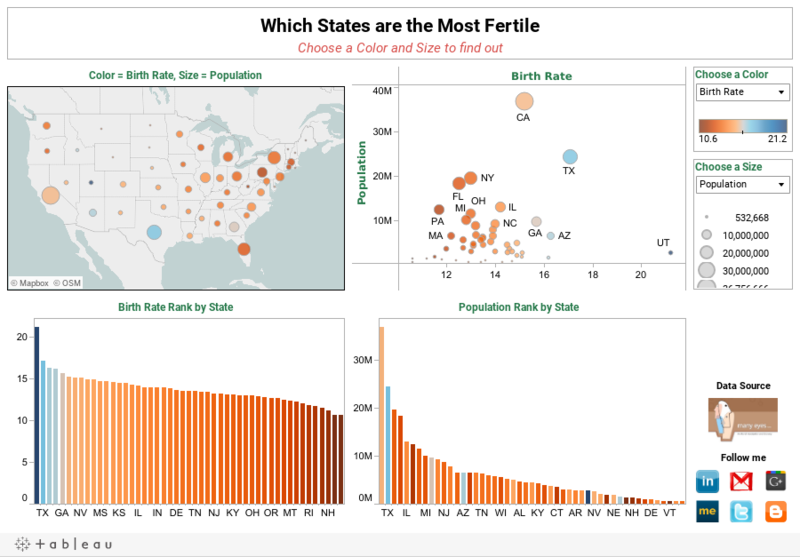 Switching from choropleth maps to States represented as bubbles can be accomplished in one click. This would be another great feature to add to Tableau once/if they add choropleth maps. I particularly like how you can crop Alaska and Hawaii to make the overall map bigger without sacrificing those States. It’s a bit annoying that you can’t do this directly in Tableau, however, you can work around it in a dashboard. There’s not enough variance in the colors, making small variances between States harder to distinguish. For some reason, most of the States are labeled, but not all of them. Not sure why that is especially considering the unlabeled States in the Southeast. Many Eyes limits you to one view (i.e., a map or a line chart, but not both). In other words, you can’t create a dashboard. If you view the map as bubbles, you can’t add another dimension or measure as a color. The default bubbles sizes make variances between States indistinguishable. There’s a scale on the lower-left, but it doesn’t automatically adjust to the data in the view. The only measure that is well represented by the size is the number of births. The map incorporates both color and size, which are set based on the measures picked on the right. Those same parameters update the other three charts. Brushing a State(s) in any chart highlights the State(s) on the other charts. Hovering over a bubble or bar reveals the details of the stats chosen. The stats update based on the selections made. You can easily see that Utah has a small population, but the highest fertility rate. Maybe it’s their religion? I’m able to use the color scale consistently through all of the charts. I made this viz with Tableau 6.1, which now allows hyperlinks on images. This certainly simplifies directing people to your social networks and data sources. How would you improve my viz? Please share. This viz displays perfectly on Tableau Public. But it won't display on this blog. I never had this problem before 6.1. Anyone else seeing this? Maybe someone can embed it in a blog of their own to test it? ?